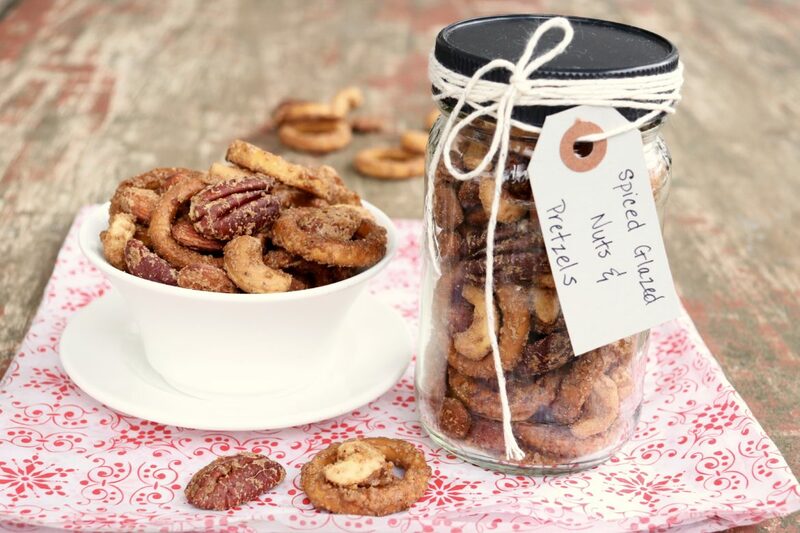 Sweet and spicy mingle with salty and crunchy in this crowd-pleasing cocktail snack that doubles as a convenient hostess or holiday gift. Want to add a gourmet touch to your next batch of chocolate chip cookies – or brownies or caramels for that matter? Dust the surface with the faintest bit of flaky sea salt. When used judiciously, salt provides opposing interest without seeming “salty” and simultaneously enhances the perception of sweetness. The crunch of coarser granules supplies an appealing textural element, too. On the flip side, adding a hint of sweetness to something classically salty can be equally delightful. Such is the case in the following snack mix, which includes a little something spicy for good measure. 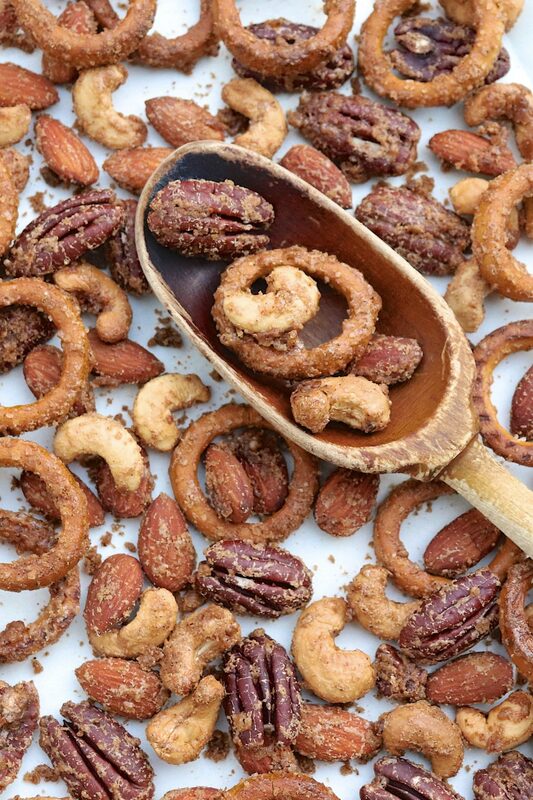 Lightly adapted from David Lebovitz’s 2009 book “The Sweet Life in Paris,” run-of-the-mill pretzels and raw nuts rise to new heights with incredible ease when combined with basic pantry ingredients. Simple as it is, David calls this one of his greatest hits, and I wholeheartedly agree. The mix of protein and carbs satisfies a case of the mid-afternoon munchies quite well, and I’ve often skipped fancy hors d’oeuvres in favor of this singular cocktail snack. Coarse salt, whether kosher or sea salt, is preferred in this recipe for its crunchy texture and more delicate taste than basic table salt. 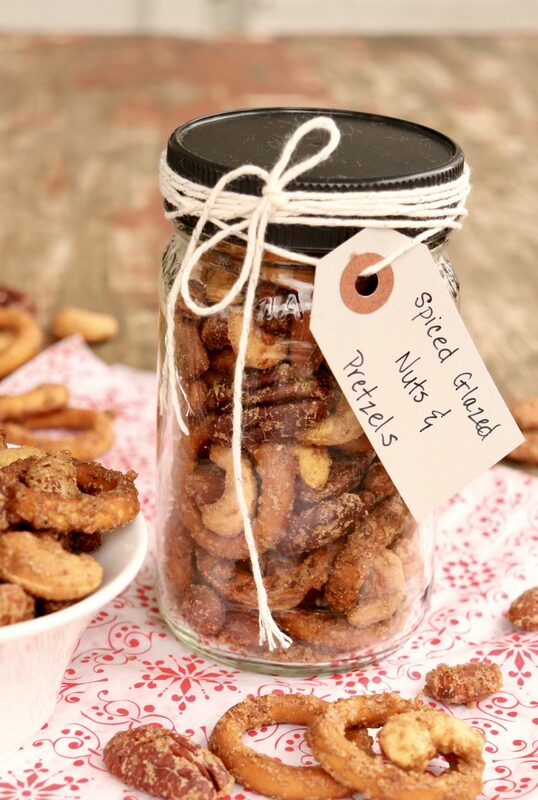 The timing of this addition – it’s added after the nuts are coated with the other ingredients – means the salt doesn’t dissolve. 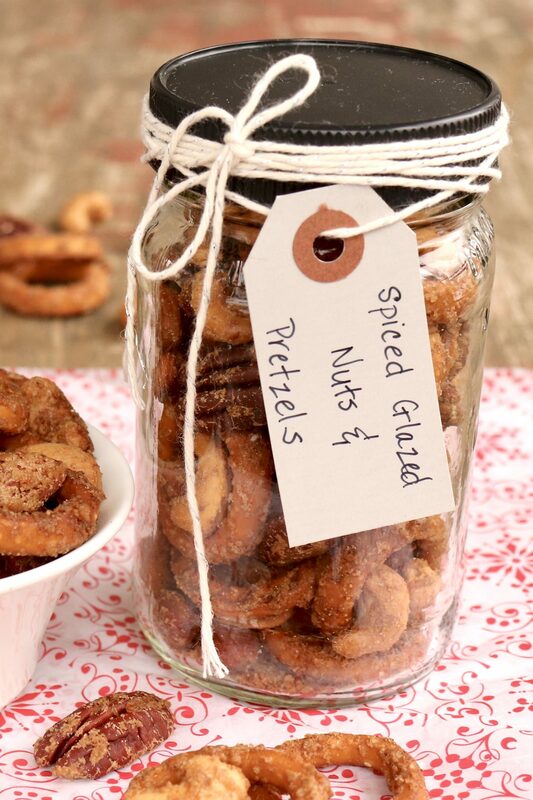 The end result is an added layer of texture on the already crunchy nuts and pretzels. Packaged in an inexpensive Mason jar and tied with a bow, the hard-to-resist mix effortlessly transforms into a thoughtful – and decidedly gourmet – hostess or holiday gift. For a more substantial gift, pair with a pretty bowl for serving or a bottle of something cocktail-y. Based on experience, I should note that a potential hazard of this recipe is snacking on the nuts and pretzels as you ready the mix, thereby reducing the expected yield. When making for my family, I’ve also learned to use proportionately more pecans than other nuts, as these tend to be a favorite. 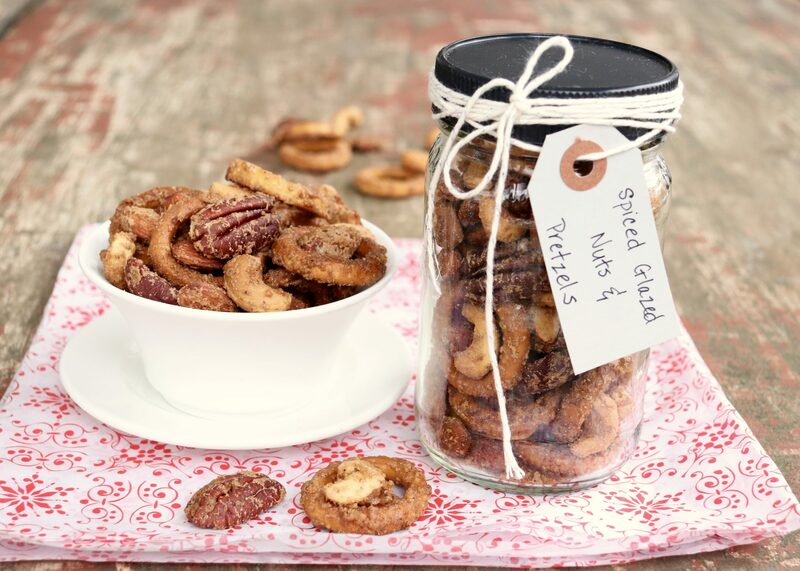 Take special note of when the pretzels and salt are added (after the initial coating of the nuts) as this contributes to the delightfully crunchy coating that makes this snack mix so irresistible. My family favors the cashews and pecans so I tend to go heavier on them. Feel free to choose the combination of nuts that suits you best. Preheat the oven to 350 degrees F. Spread the nuts on a large, rimmed baking sheet (line with parchment paper for easy cleanup) and roast for 10 minutes, stirring once after 5 minutes for even toasting. In a large bowl, mix together the melted butter, brown sugar, cinnamon, cayenne and maple syrup. Immediately add the warm nuts to the butter mixture, stirring until thoroughly coated. Then mix in the salt and pretzels, and stir until the nuts and pretzels are evenly coated. Spread the mixture back on the baking sheet and return to the oven for 12-15 minutes, stirring twice during cooking. (In my oven, I bake for 5 minutes, stir, bake 5 more minutes, stir, and then bake for a final 2 minutes.) Remove from the oven and cool completely, separating the nuts and pretzels as they cool. Once cool, this mixture can be stored in an airtight container for a week or more and makes a delightful hostess gift. *This snack mix isn’t crazy spicy, but it does have a nice kick. If you prefer a milder mix, you may wish to reduce the cayenne pepper to 1/4 teaspoon. Conversely, if you subscribe to the-hotter-the-better rule of thumb, you could increase the cayenne to 3/4 teaspoon. **If the brand of pretzels you’re using is rather salty, you may reduce the added salt by a pinch or two. Also, if you have pretzel sticks or another small shape on hand (my nieces like rounds because they make good rings! ), you may use them in place of the twists. Tip: If you melt the butter in a large bowl, you can do all the mixing in that bowl and have one less dish to wash.
One more thing: David’s original recipe incorporates 1 teaspoon smoked paprika and 1/2 teaspoon unsweetened cocoa into the butter mixture. Feel free to try that version, too. Adapted from The Sweet Life in Paris. I tried your pretzel mix today. I did not add salt and I used pieces of salt free pretzels and added those little round rye things. It was not too spicy and we did not miss the salt. I really liked it and plan to serve to company late this week! Great news, Joan! So happy you enjoyed and hope it’s a hit with your guests! Had a group of girlfriends visiting this afternoon and served this as a snack. It was devoured and everyone wanted to recipe! So happy to read this, Terri. Thanks for the great feedback!